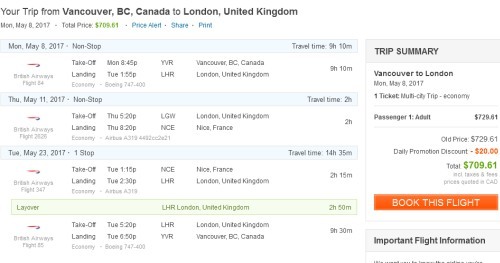 British Airways is showing some price drops that allow you to fly from Vancouver to London, UK and then from London to Nice in the South of France, and back home to Vancouver - all 3 flights for $709 CAD including taxes. The initial flight to London and the flight to Nice are both non-stop. The flight home from Nice to Vancouver has 1 stop in London for 3 hours. This only works for a very limited number of date combinations in October 2016 and May 2017. However, both of the date combinations are over Canadian holidays. One less vacation day to use up. vancouver, yvr, flight deals, europe, western europe, united kingdom, london, england, lgw, france, nice, nce, british airways, uk and south of france.